1R6223W for 88-note keyboards, Stand & Rack from SKB. SKB Corporation has added three new keyboard cases to their lineup of keyboard transport solutions. These new models are the 1R6223W for 88-note keyboards; 1R6218W for 88-note narrow keyboards, digital pianos and controllers; and 1R4417W for 61-note keyboards. SKB Keyboard Cases are rotationally molded from Linear Low Density Polyethylene (LLDPE). They also feature SKB's glass reinforced nylon trigger latches with TSA locks, enabling users to safely lock the cases and still have them inspected by airline security personnel. 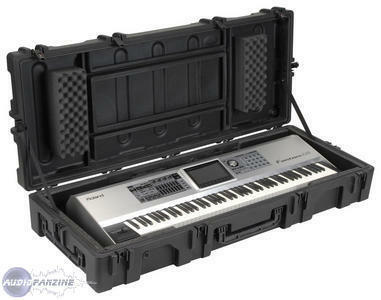 The SKB keyboard cases feature a combination foam/cleat interior, which holds the instrument securely during transport. Adhesive backed foam for the interior lid is provided loose, so the musician can customize the fit of the case to match the keyboard. Special, reinforced bridging in the lid gives these keyboard cases the strength to withstand the most demanding tours. 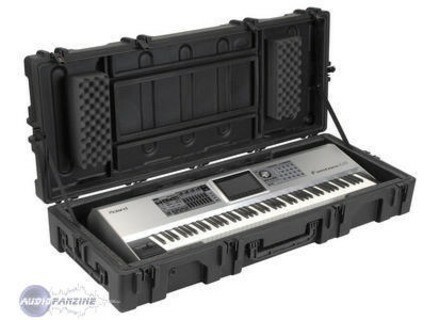 Cases are available in 88 standard, for keyboards such as the Korg Oasys 88, Roland Fantom G8 and Yamaha Motif XS8,88 narrow for keyboards such as the Korg SP250, Roland RD700SX and Yamaha CP33, and 61-note configurations for keyboards such as the Korg TR61, Roland Fantom G6, and Yamaha MOTIF XS6. The 76-note version will be available later in 2009. The new keyboard cases include built-in wheels, offering tilt-and-go transport. Additionally, the case is water resistant and excellent in inclement weather. The new keyboard cases will be available January 2009 from authorized SKB dealers with pricing TBD. SKB is exhibiting at Booth 4210 (Hall C) at the 2009 Winter NAMM Show in Anaheim, CA. For more information, visit their web site at www.skbcases.com. Kaces Releases New Rack Cases Designed to protect rack equipment and provide connections between the computer and rack gear, these cases features a lightweight frame reinforced with rigid plastic panels that are designed to absorb shock and protect equipment. IK Multimedia GPU Stage Case In the brand's new series of StompIO-related accessories, IK Multimedia has announced the release of the GPU Stage Case. IK Multimedia StompIO Tour Rack In its series of accessories aimed at making easier the use on stage of its Amplitube and StompIO products, IK Multimedia has announced the release of the StompIO Tour Rack.